Record your GoToAssist Seeit sessions for later review or technician training. Save everything for your files. A well-structured service workflow should always include full documentation. Who helped who, what was said and how things were resolved. So if any question about the request comes up, it can easily be answered. 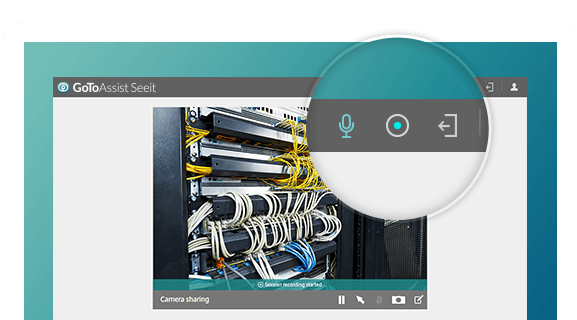 To that end, GoToAssist Seeit allows you to record your sessions and then download the video afterward. Once you have a customer in a GoToAssist Seeit session, you can choose whether to record the session or not. All you need to do is click a simple button in the toolbar, and the video feed, audio conversation and arrow annotations will be captured in the recording. When it comes to troubleshooting hardware, sometimes the easiest solution is to watch someone going through the steps. 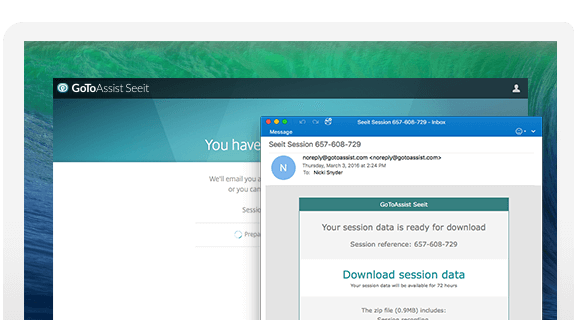 By recording your GoToAssist Seeit sessions, you create an easily shareable video that customers can view to solve their own issues. So the next time you get a customer with the same problem, you can share the resource and save the day. All session data is available for 72 hours after a session ends. Once you finish helping a customer, you can easily download the recording from the post-session page. GoToAssist will also send you an email with a quick link to get the file. Take photos during your support sessions for a record of the issue. See your photos in a thumbnail gallery and download the set after a session ends.